Not too long ago, one of the topics on Blogkadahan.com, the group blog I belong to, is Filipino cuisine where we talked about the food that most of us grew up with. There were so many great recipes posted that I didn’t know where to start. One of the recipes that caught my eye is this Shiitake Surprise which, although not a traditional Filipino dish, is a recipe invented by a true blue Filipino. When I found a huge bag of dried shiitake mushrooms at Costco at a bargain price, I knew then exactly which recipe I would use some of it for. We love vegetables, any vegetables, and this combination was just excellent. The recipe below is just as Lolo Jose posted it, I just changed some of the proportions based on what I used. Heat the olive oil in a large nonstick skillet over medium heat until hot. Add all the mushrooms and beans and sauté until tender, stirring constantly, about 5 minutes. Add bell pepper, ginger and garlic and sauté 2 minutes. Add spinach and green onions and stir until spinach wilts, about 2 minutes. Add the oyster sauce. Season to taste with salt and pepper. Transfer to a serving bowl and serve immediately. This preparation makes around 6-8 servings. This was absolutely delicious! Can be eaten with steamed rice alone or with your favorite meat dish. 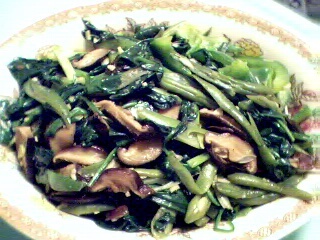 Hi Tin and Joey, this dish is super healthy. Just check out the nutritional breakdown from doc’s original post. Tin, I just love the shiitake from Costco. It is the best. Most of all it’s only 9.99 for that huge bag. Normally, I pay that for a small bag at the oriental store. Hello…I love any kinds of veggies and shiitake mushroom is my favorite – I actually get mine in Costco too the dried one-its the best isn’t..This dish is so easy to mak… I will try this..yummy!